As I mentioned earlier, we’re getting ready for a trip. 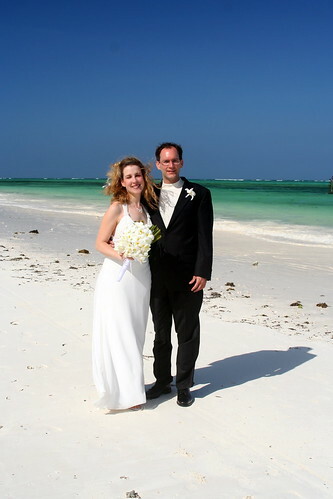 Six years ago Kathleen and I went to Kenya and Tanzania for a 2 week African Safari and ended the trip with a 3 day stay on the island of Zanzibar where we then got married. We’ve decided to go back! We head out later this week on a long overdue vacation. This time we’ll be starting in Victoria Falls before heading out across much of Zambia and Namibia to see some of Africa’s amazing wildlife and landscapes. I’m not sure how much Internet access we’ll have during the trip (likely more than six years ago), but we’ll try to post a few pictures here and/or on my Facebook page as we can. Hi Jeremy – Stumbled on your flkr photo site by accident. Looked up a Lancair that was for sale near your home airport (Pine Mtn. Lake?) and somehow ended up looking at great photos of you getting married to Kathleen – in Africa! You two looked like a really interesting couple, so browsed around thru many of your pictures. Perusing around your shots was a blast. Really fun. Great collection you’ve built up. You have certainly traveled far and wide – many of your photos are truly superb. We seem to share a love of flying, so was of course drawn to all the numerous shots of you and your airborne experiences. I started flying long before you were born – and am about to get back to it. Been living at an Airpark in SW NM, but my grown kids live on the West Coast, so driving is just too much – and my empty hangar is lonely, anyway. Both my daughter, who lives near Santa Ynez, and my son, who lives in Portland, soloed sailplanes at 14 in S. CA, but sadly haven’t gotten back to it, since. My son’s also a software engineer, something he started at 9, when he went to Santa Monica College and obtained their first AA in Computer Science – and my daughter worked for a novel and successful Internet world marketing company, NOVICA, after leaving her work as a journalist and before getting married and going back into her love of horses pretty much full-time. Looked as though you were encouraging Kathleen to learn to fly, too, or was she already doing so before you were hitched? My kid’s Mom got her Commercial in sailplanes before I did and was hyper active in the 99’s, ending up as Governor of the SW Section. Do you know Marle Hewett? Suspect he lives near you and appears to also fly out of Pine Mtn. He’s got a neat video on YouTube of the Lancair he’s trying to sell. The whole article have good content regarding heading to Africa: Victoria Falls, Zambia, Namibia. I must say you did good research on it then like to shared with us.I like to say Congratulation to both of them for a new start of the life. I have read their interview at http://www.8b3nv1.com in which they told the story of this journey. Thanks for sharing it. Good to hear from you – and really appreciate your remarks about the Classic Air Odyssey to Africa. Much easier to research that sort of story these days with the Internet at hand. Thanks for the kind comments! Cheers, ric lambart, Columbus, NM . . .